1.In large saucepot, heat 2 teaspoons butter and oil over medium heat. Add carrot, onion and celery, and cook 5 minutes, stirring frequently. Add whole tomatoes, diced tomatoes, tomato juice, thyme, sugar and pepper. Heat to boiling over medium-high heat; reduce heat to a simmer. Partially cover and cook 30 minutes, stirring every 10 minutes to prevent sticking. Stir in half and half, and remove from heat. 2.Meanwhile, preheat broiler. Place bread slices on rimmed baking pan. Divide and spread remaining 1 teaspoon butter over bread slices, and sprinkle each with cheese. Broil 3 to 5 minutes or until tops are lightly browned. 3.In batches, transfer soup to blender and purée. Transfer puréed soup to large bowl before puréeing next batch. 4.To serve, ladle soup into individual soup bowls. 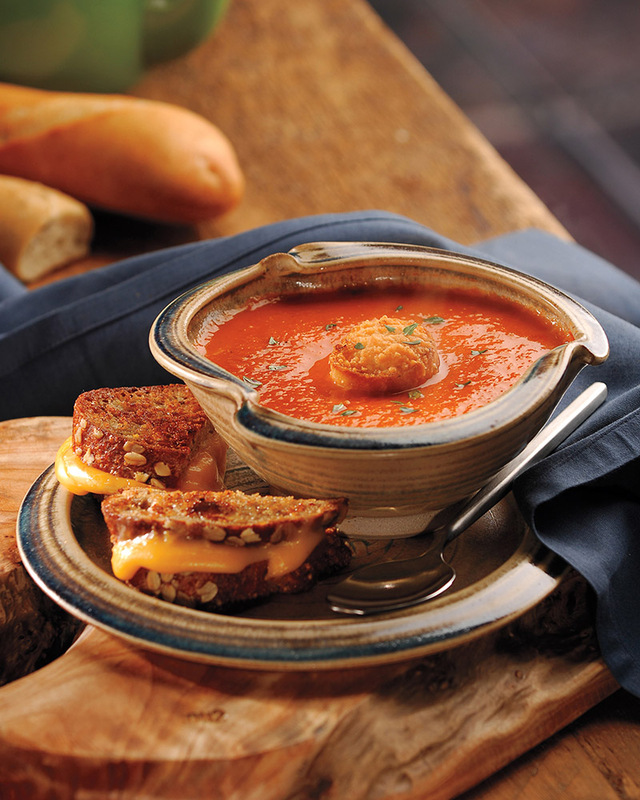 Top each with a Parmesan crouton and garnish with thyme leaves. This soup is wonderful as it is! However, if you want to pack in even more vegetables, once the soup is puréed, stir in 4 cups packed spinach leaves or baby kale leaves.